Lidded containers always pique my interest for what I'm going to find in the container or even what the container might be used for. 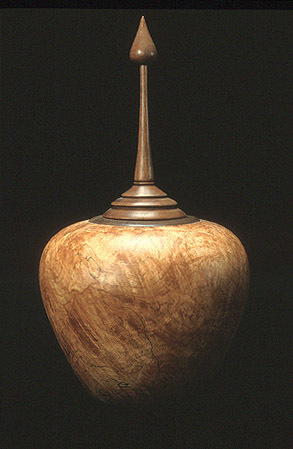 This was one of my earlier attempts at lidded vessels and was made using two different woods for contrasting colors and durability. The bigleaf maple burl provides great colors with random grain patterns, but isn't strong enough for usage as a lid that must sustain constant open and closing action, so walnut was inserted for its resistance to wear, as well as for its contrasting color. Shapes that have influenced me and that in part inspired this piece are from ancient and past artisans, primarily Asian; this appreciation of earlier masters will prove to be an influence in many future lidded containers. Using smaller hand tools - many of which I forge or fabricate specifically for these kinds of delicate turnings - the interior of the burl was excavated to a wall thickness of 1/8 inch. For a better idea on how this is accomplished with larger hand tools please see The Making of A Hollow Vessel.